LA Unified board member Steve Zimmer is asking the board to weigh in on a legal battle between a major fruit company and the United Farm Workers (UFW) union. 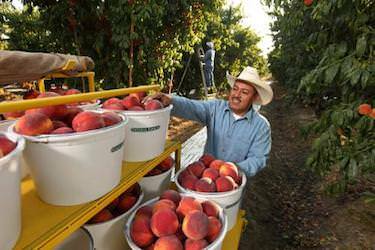 Gerawan Farming, one of the country’s largest suppliers of peaches, plums and other fruit, has had contracts with LA Unified and is under consideration for future deals, according to a resolution authored by Zimmer that will be heard at tomorrow’s board meeting. It appears to be the latest effort by Zimmer to use LA Unified’s contract negotiating power to put pressure on the food industry for changes in the way it grows food, treats animals and treats workers. He recently co-sponsored the board’s “Good Food” resolution, which was passed in December. It calls on the district to purchase healthier foods and to only work with vendors who provide a safe environment for workers and a cruelty-free environment for livestock. The fruit company is currently involved in a legal battle with UFW over the union’s representation of its workers, and Zimmer’s resolution calls on Gerawan to comply with state and federal labor laws — which it is has been accused of breaking — and immediately implement a labor agreement issued by a neutral mediator and the State of California. The resolution also calls on the district’s Procurement Services Division to report back to the board on Gerawan Farming’s compliance with fair labor practices before any contracts with it are brought to the board for approval. An administrative judge is hearing the case that could decide whether more than 3,000 farmworkers employed by Gerawan Farming will be represented by the UFW. The UFW won the right to represent Gerawan workers 20 years ago, but never negotiated a contract and the case remained in limbo until 2012, when the UFW again requested the right to bargain on the workers’ behalf. A contract was negotiated in 2013 with a mediator but was never honored by Gerawan because, in November, Gerawan workers held an election that attempted to decertify the UFW’s representation of Gerawan workers. The Agricultural Labor Relations Board (ALRB) has refused to count the ballots until it investigates a number of complaints of unfair labor practices against Gerawan that includes intimidating workers into voting for decertification.